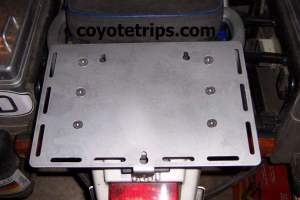 The adapter plate is designed for my top box, but will work with most aluminum top cases of other manufacturers. The plate is laser cut from 3mm (1/8") aluminium. 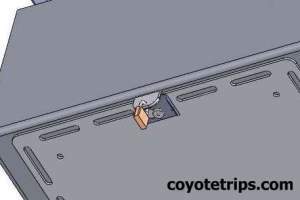 It has a quick-release function for the top box and is lockable. 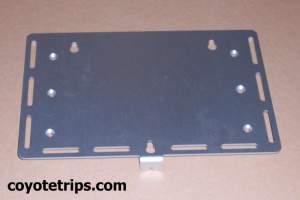 The plate will be attached with 6 screws to the original rack. The screws replace the original screws, no drilling necessary. The top case with the 3 holding pucks is set into the 3 slots, and then moved forward to the end of the slots. The locking plate is set around the back puck, and then moved sideward until the holes align. Then the whole thing can be locked with a padlock, and so the top box is protected from theft. 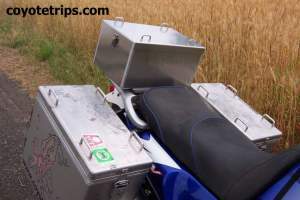 With a little experience the top box can be put on or off in less then 30 seconds. No tools necessary! Without the top box e.g. 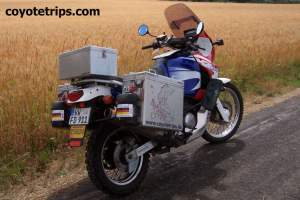 a luggage roll can be fixed to the plate with bungee cords. Surfaces anodized for long lasting corrosion and scratch resistance. if bought together with a Top Case.